Bustling, noisy (in a good way) and modern are words that describe Rustico’s new location. The popular restaurant opened its new space just steps from its old location on Monday evening. It was a full house as diners were excited to sample the new menu in the new venue. When I arrived with my dining partner, I was quickly escorted to the bar and served a glass of Chakana Reserve Malbec – a favourite of mine. The time spent sitting at the bar was used to check out new restaurant. The walls are white with a clean design. Italian phrases such as al fresco are painted on the panels close to the ceiling. The bar area has a similar modern feel meets rustic with exposed brick at the back of the bar – a really nice touch. 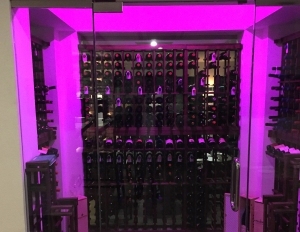 The wow factor would have to be the in house wine cellar, which can be seen from every seat in the restaurant. It’s illuminated by purple lights and is filled with wines from around the world. Ok, enough on the décor. Let’s talk food. If you’ve ever been to Rustico, you know you’re in for a wonderful meal. The food isn’t outright Italian, more Medittereanen. I started with Polenta stuffed with tallegio cheese with black truffle and marinara. This was a tasty appetizer that I would order again and again. My partner had Minestrone, which he described as hearty and full of flavor. Next up was broiled mushrooms stuffed with goat’s cheese. This simple dish made my mouth water simply because broiled goat’s cheese is magic to me and stuffed in a mushroom is even better! For my main course, I ordered the catch of the day – wahoo with mushroom risotto and veggies. My partner opted for tuna steak with salad. In both instances, the fish was cooked perfectly and had simple seasonings not to distract from the flavor of the fish. The risotto was delectable – heavy on the mushrooms and rich with the addition of truffle oil. It was a delicious plate of food that left me wanted more. For dessert, I opted for classic crème brûlée. Now the way to measure if it’s done right is to listen out for the crunch from the torched sugar. As soon as my spoon hit the crème brûlée, I heard that crunch and knew it would be delicious. And it was – perfectly creamy while not being overly sweet. Head to Rustico’s new location if you are looking for a great Italian-style meal in a modern, upscale space with excellent service. You won’t be disappointed.